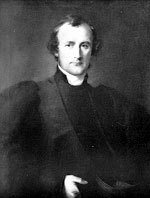 Almighty and everlasting God, we thank you for your servant George Augustus Selwyn, whom you called to preach the Gospel to the peoples of New Zealand and Melanesia, and to lay a firm foundation for the growth of your Church in many nations. Raise up in this and every land evangelists and heralds of your kingdom, that your Church may proclaim the unsearchable riches of our Savior Jesus Christ; who lives and reigns with you and the Holy Spirit, one God, now and for ever. This commemoration appears oin A Great Cloud of Witnesses. Selwyn was born in London in 1809, educated at Eton and Cambridge and ordained in 1833. In 1841, he was made first Bishop of New Zealand. He diligently studied the Maori tongue on his long sea voyage, and was able to preach in it on his arrival. He laid the foundations of the Church, not only in New Zealand, but throughout the islands of Melanesia. (This was the result of a clerical error. The northern boundary of his diocese was supposed to be the parallel of latitude 34 degrees south of the equator. The official document read "north" instead of "south," and Selwyn cheerfully accepted responsibility for the vast Pacific regions of the Melanesian and Polynesian islands as well as New Zealand. In 1957 the Islands became a separate Province of the Anglican Communion.) In the ten-year war between the Maoris and the European colonists, Selwyn managed to keep the confidence of both sides, and ultimately at the first general synod of the Church in New Zealand in 1859 to secure the adoption of a Constitution that established the principle of full participation by Maori Christians at all levels of Church government. In 1867, Selwyn was pressured to accept appointment as Bishop of Lichfield. Reluctantly, he returned to England, where he died eleven years later.